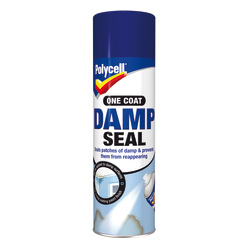 Polycell One Coat Damp Seal Aerosol has been specially formulated to seal patches of penetrating damp on interior walls and ceilings in just one coat, preventing them from showing through and spoiling decorations. This anti damp paint has a matt white finish that can be over painted or wallpapered if required. Prevents damp from showing through ad spoiling decoration. ToolsBrush, masking tape, safety glasses. Thoroughly clean and repair the surface. Remove any wallpaper or loose paint. If mould is present, use Polycell Mould Killer. Allow new plaster to dry for 7-10 days before using this product. Mask surrounding areas to protect from overspray. Shake well until you hear the steel pellet rattling and then continue for 1 minute more. Spray evenly over damp patch from a distance of 20-30cm (9″-12″) until patch is covered. Shake can occasionally during use. 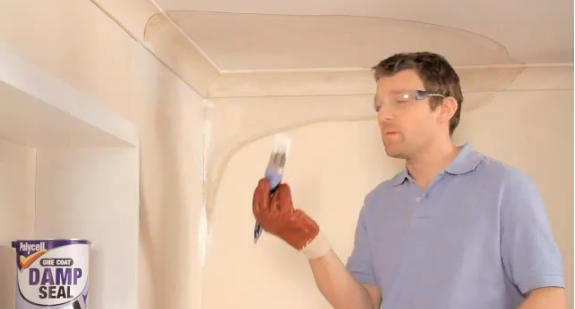 Allow at least 2 hours to dry before painting or wallpapering. For heavier damp patches apply a second coat for best results. After use, invert the can and spray until nozzle is cleared to prevent clogging.